Two weeks ago my husband and I moved into a new apartment in Manhattan. We love everything about our new place, but (there’s always a “but”) the kitchen is tiny. I mean really tiny. I have about two square feet of counter space and I can’t open my oven and dishwasher at the same time. But I loved the rest of the apartment so much, I told myself it would be okay. My friends and fellow cooks reassured me that sometimes the best food comes out of small kitchens and I would find a way to make it work. And I did. Four days later my oven broke and it’s been out for nearly a week now. As my Nanny always says, “you just have to make do and mend.” But to tell you the truth, I’ve hardly missed my oven. I’ve made some delicious stove top meals (the cook top still works) and of course my slow cooker has been working overtime. 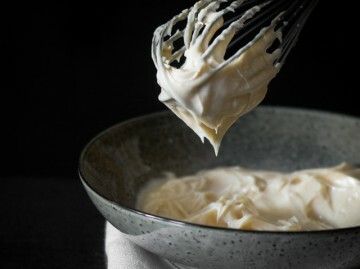 This recipe called out to me because I love anything with coconut milk in it. And my husband is a curry fanatic. 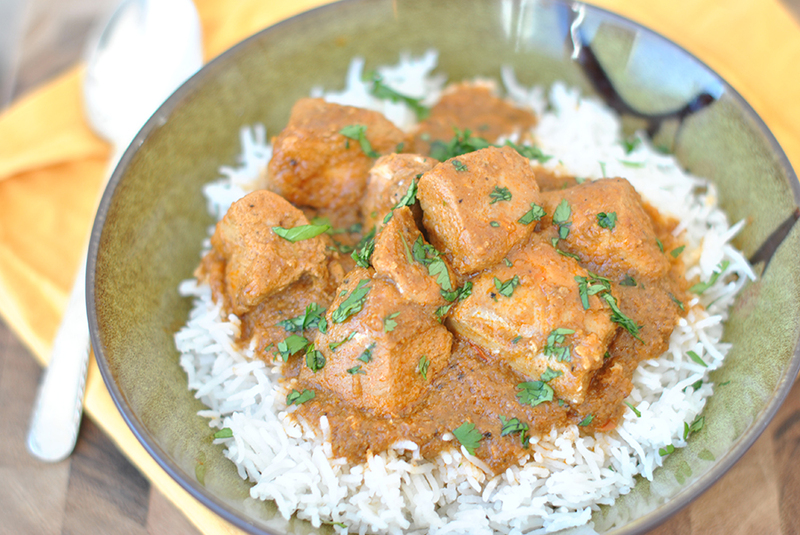 This Slow Cooker Coconut Chicken Curry was everything Ayalla (Tasty Kitchen member saltandpaprika) said it would be: easy to prepare, delicious and “mild but complex with deep flavors.” This recipe gets two big thumbs up from me. I’ll definitely be making it again. The recipe calls for chicken, onion, garlic, bell pepper, tomato paste, coconut milk, curry powder, garam masala, optional red chili peppers, and cornstarch. 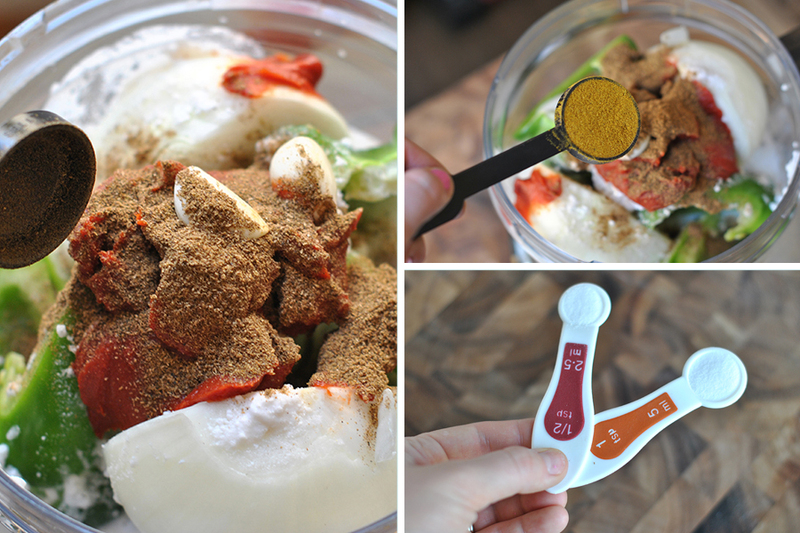 Click the link at the end of this post for the printable recipe with all the measurements. 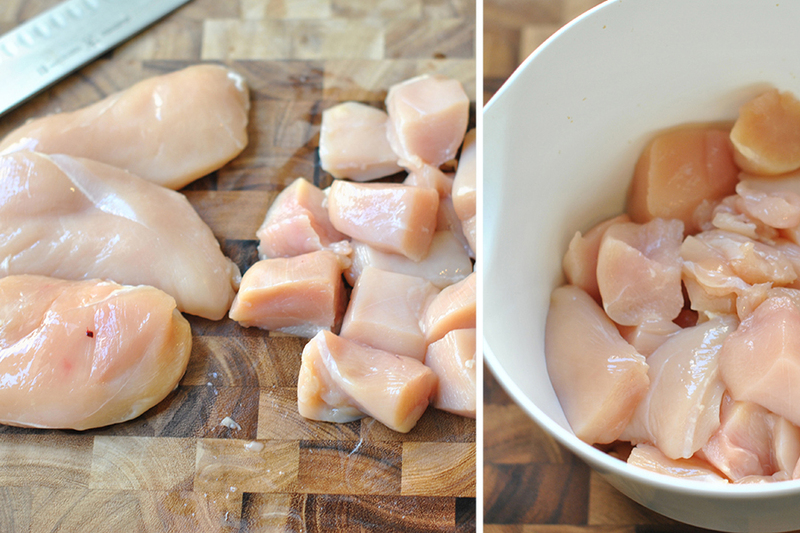 Start by cutting your chicken breasts into large cubes. 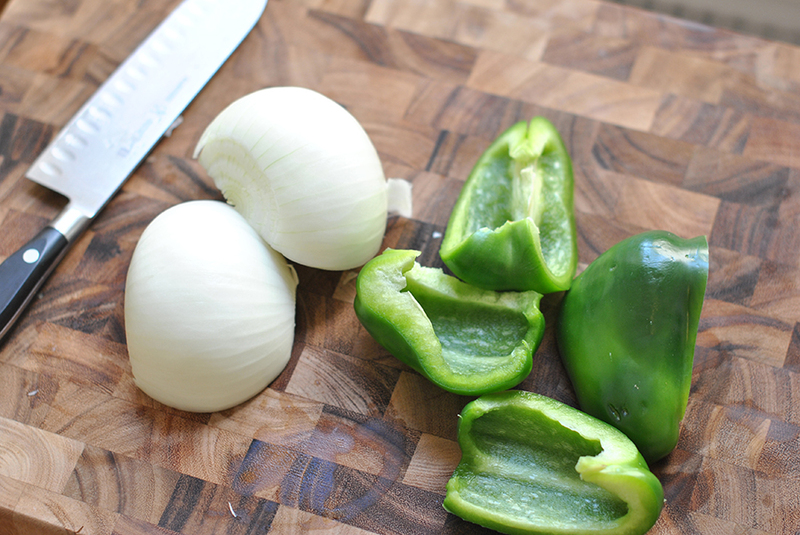 Cut your onion in half and remove the skin, then cut the green peppers into quarters. 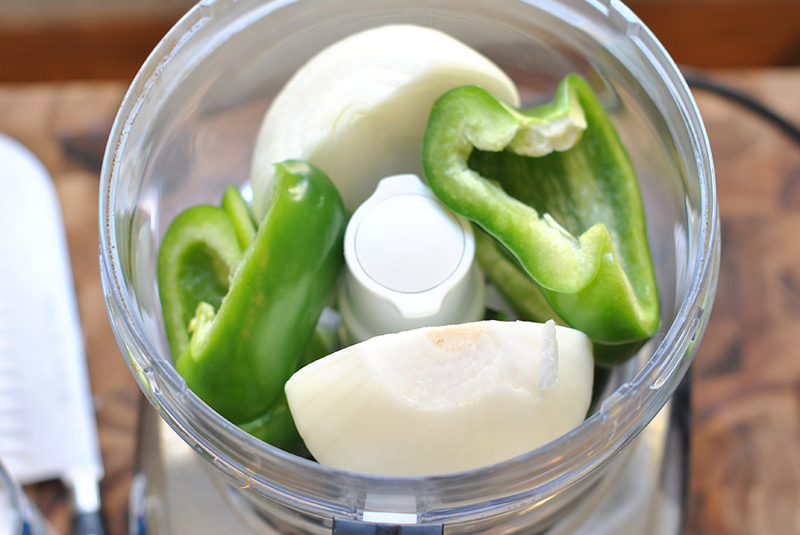 Place the onion and pepper into the food processor. And garlic cloves. Also add the optional chilies at this time. Add the garam masala, curry powder, and salt. Food process until smooth. Cover with the sauce, stir to coat. 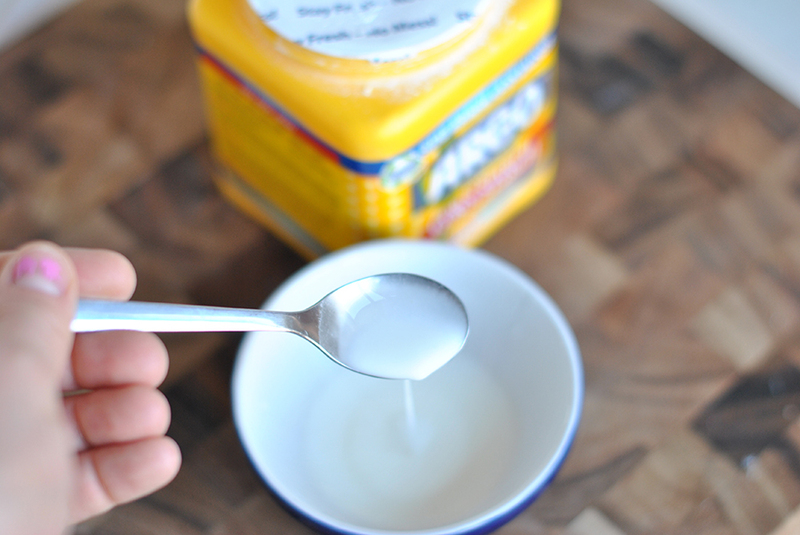 One hour before you’re ready to eat, mix the water and cornstarch until the cornstarch is completely dissolved. Add to the curry and mix well. Put the lid back on the slow cooker and cook for the remaining hour. Serve with a big bowl of aromatic rice (such as jasmine or basmati) and garnish with lots of fresh, chopped cilantro. This will keep for a couple days and is even better the day after! Thank you, Ayalla, for this wonderful recipe. Ayalla Weiss-Tremblay is the cook behind the Canadian food blog, Salt and Paprika. She’s a wife, mother, administrator and an excellent cook! 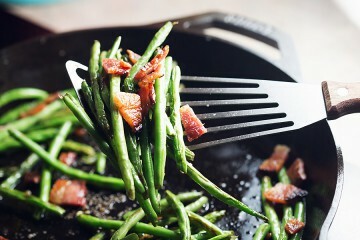 Stop by her blog to see what’s she’s cooking up this week! 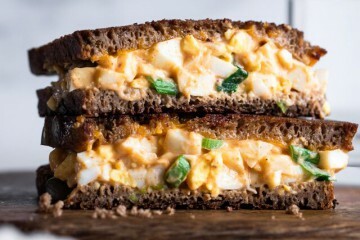 See post on saltandpaprika’s site! This delicious chicken curry recipe is dairy-free, relatively low fat (no butter, cream or heavy yogurt!) and definitely hassle free. It couldn’t be easier to prepare. All the ingredients except the chicken are pulverized to form a creamy sauce in the food processor and poured over the chicken. Done! The taste is the antithesis to the ease preparation. Mild but complex and deep with flavour. 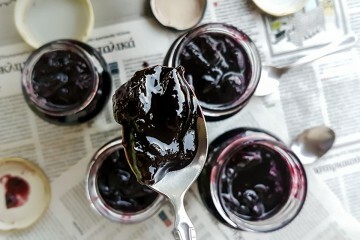 It is exceptionally yummy! 1. Place chicken cubes inside the slow cooker. 2. Place therest of the ingredients (except chili peppers, cornstarch, water and coriander) in a food processor bowl and process together until the mix is smooth(ish). Pour sauce mix on top of the chicken, mix well, add hot peppers if using any, then close the lid. Cook on low for 6 hours. 3. 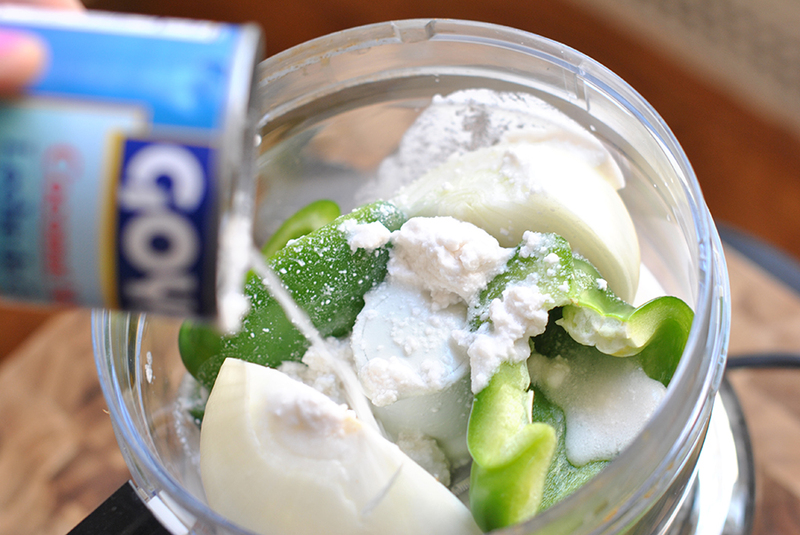 An hour before serving, mix together water and cornstarch until the cornstarch is completely disolved. Add to the chicken curry and mix well. Place the lid back on for the rest of the cooking time. 4. Serve on top of steaming white rice, something wonderfully aromatic like jasmine or basmati rice. Decorate with lots of chopped coriander. Inhale. So good! Help! I can’t get the printable recipe link to work. Can you send it to me? i luv the Grandma Chicken Curry. chicken curry looks yum and delicious. And personally, Goya coconut milk is not the best one out there. The brand Thai Kitchen makes THE BEST coconut milk, very flavorful and even has a lower fat version. Goya just doesn’t cut it compared to Thai Kitchen brand. I really wanted to like this. I was excited about it. But….alas, it was really, super bland. I mean really, really bland. My chicken stayed moist — I didn’t cut it into pieces and I did a mix of chicken thighs and breasts. The chicken just kind of fell apart into shreds by then end of cooking. The sauce was my issue. Where is the flavor? I added more garam masala, more curry, more chili peppers — then I improvised and added salt, the juice of two lemons, chili powder and finally greek yogurt and cilantro. It still was just okay. Sorry! I wanted to like it, I really did. My fiance and I made this today and we loved it! It was so easy to put together, and the smell from the kitchen drove us wild all day. Very very tasty! We could have used a little added spiciness, though – any suggestions for some added heat without ruining the flavor? Should we add some cayenne pepper? 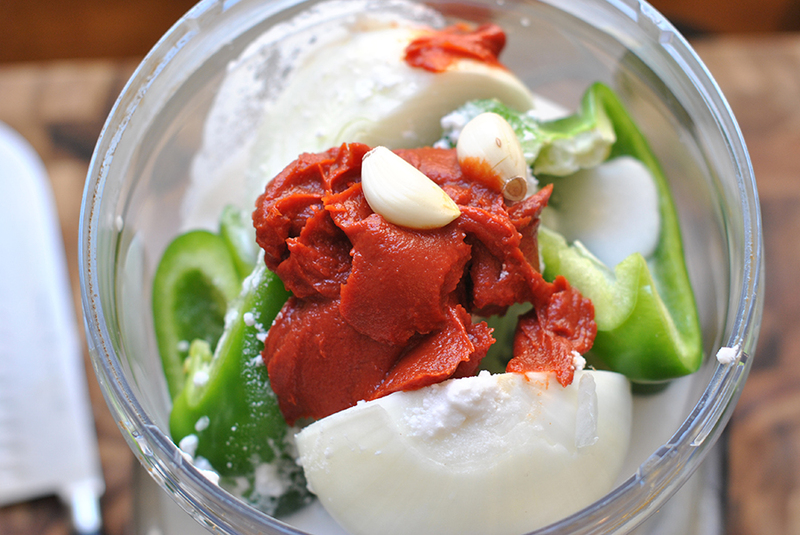 Or what if we put a serrano chile or something in the food processor with the other veggies? Thanks so much for a lovely slow-cooker meal! This turned out really yummy. Very flavorful and tender chicken. I also made a batch with tofu for my vegetarian daughter, and she loved it. This was so delicious! I made it for dinner on Tuesday and I was in Indian food heaven! And healthy too! Thanks for sharing! OMG … I prepared the sauce last night and it’s in the slow cooker right now. I can’t wait. The sauce already smelled delicious which made me super excited. Can’t wait to try it later. 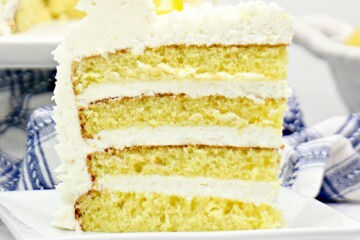 Thanks so much for this easy to prepare recipe!!! I don’t have a food processor. 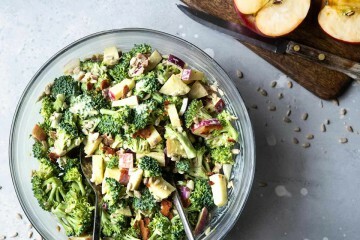 Would dicing/chopping very small and then mixing everything still work? Made this last night and it was wonderful! Smelled so great and my kids liked it as well. I made a few modifications. 1lb bonesless/skinless chicken thighs + 1 cup lentils, light coconut milk for the regular coconut milk, used a yellow pepper since that’s what I had on hand, and I only added 1/2 Tbsp of the curry powder because I thought it would be too spicy for the kiddos. I also totally forgot about the cornstarch at the end, and it wasn’t too soupy. This is a great sauce and next time I think I’ll add cauliflower and/or potatoes. This looks so so so good! 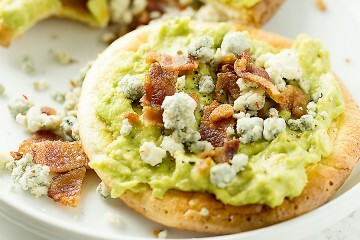 We will be making this tonight! Also, we feel you on the tiny kitchen issue. It’s rough, but definitely manageable. 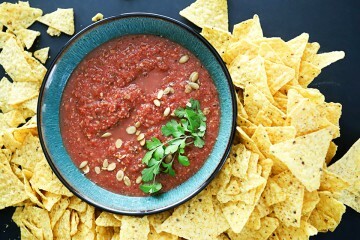 I am making this tomorrow night…just bought all the ingredients…questions though: the recipe says a 156ml can of tomato paste…I looked that up online and that comes out to a 5.something oz can. I see above you have an 8oz can which is the smallest I could find. Did you use the whole 8oz???? Just turned on my crock pot. Hope it looks & tastes as good as yours! I made this tonight, and the sauce is definitely delicious, but I was also concerned about the chicken getting over-cooked and dry. 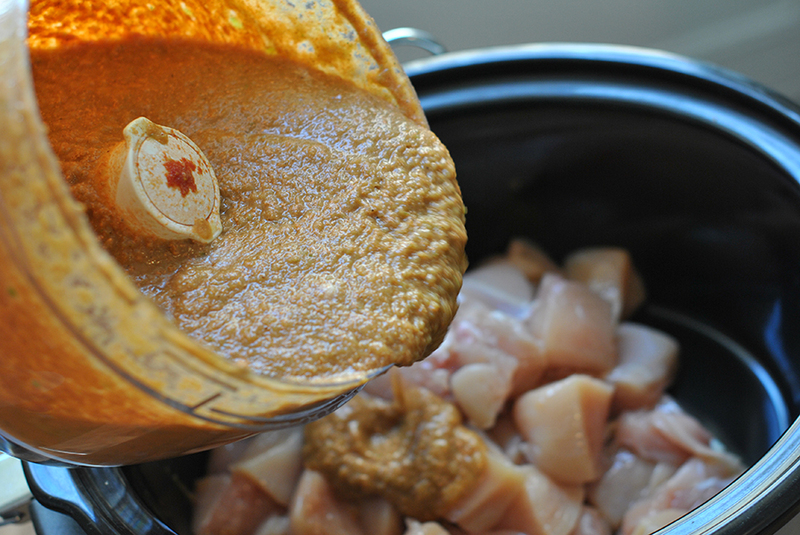 I have never had success with chicken in the slow cooker – it is always dry. BUT, I decided to give it another shot with this recipe. I checked the chicken after 3 hours, and I had to shut off the cooker. It was very dry and barely edible (but we’re eating it because I don’t want to waste 2 pounds of chicken. :). I think it has to do with the quality of the slow cooker one is using. I don’t have a top of the line cooker, and I’m wondering if my low setting isn’t necessarily low. At any rate, the sauce is wonderful, and so very easy. If I use my slow cooker for this recipe again, I would probably cook for only 2 hours or cook in a dutch oven. This sounds delicious- except I hate coconut! I am going to try the chicken stock like jordan suggested. Any other suggestions for an alternative to the coconut milk? Are the chili peppers the source of heat in curry? I love curry but my family won’t like it if it’s spicy/hot. newmom101 – the corn starch will thicken the sauce. This is in my slow cooker RIGHT NOW and I CANNOT WAIT until it is done. My house smells amazing. Why the cornstarch at the end… what does that do? 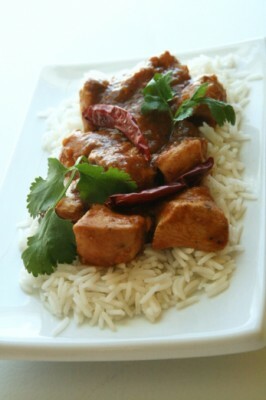 This recipe is now on my weekend cooking menu, even though we had tikki masala last weekend. I never tire of ethnic foods! Thanks for sharing. So glad it turned out well! For quick, easy, homemade curry that tastes authentic – this recipe can’t be beat. Yum! I’m making this right now and just realized I forgot to get the garam masala at the store yesterday!! Any suggestions, fast!? We had it last nite and it was SO good! Thank you for a great slow cooker recipe I know I’ll make again and again. Smells great and tastes better. Just what I’ve been looking for. 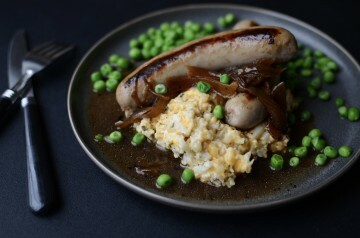 Similar to a restaurant recipe that we haven’t had since they closed and moved across town. I’m happy to see that Penzey’s bag of spices up there, I’m a huge Penzey’s fan! I can’t live without their cinnamon! Are those dundicut peppers? Wow, you’re brave! That looks amazing and easy! I can’t wait to try it! YUM! 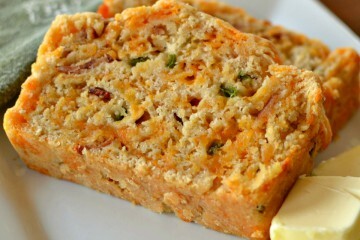 I love that it is made in the slow-cooker! This curry looks delicious! I actually just made a peanut chicken curry in the slow cooker. 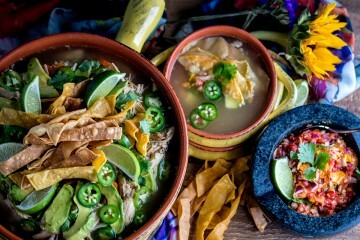 Love anything in my slow cooker! Gurrrrrrrl! We somewhat made this tonight. YUM! My three year old ate my last bell pepper so instead, I put spinach in the sauce along with cumin, chili powder and turmeric because I didn’t have any garam masala or curry powder. We sautéd shrimp in a little bit of olive oil then added the sauce to the cooked shrimp to heat it up. 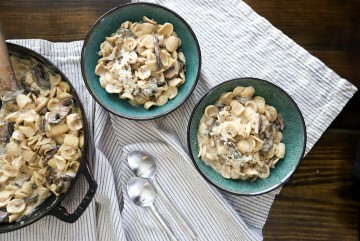 We served it over whole wheat noodles and my husband, 3-year-old and I gobbled it up! Thanks for the recipe!!! This is pure warmth & comfort & fresh in a dish. Mmmmm looking forward to trying it out. Just made the sauce – didn’t have time to slow cook it today – I’ll just add the chicken thighs in the morning. I’ve been hankering for something like this – thank you for the recipe! 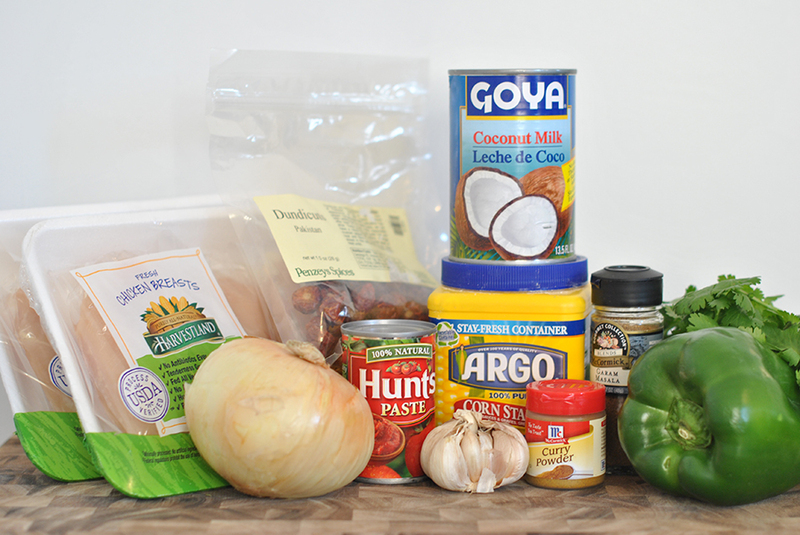 I love coconut chicken curry, and I love my slow cooker! Thanks for finding this TK gem! I’ve got it in the slow cooker now!! Looking forward to it! Can you substitute something else for the green pepper? 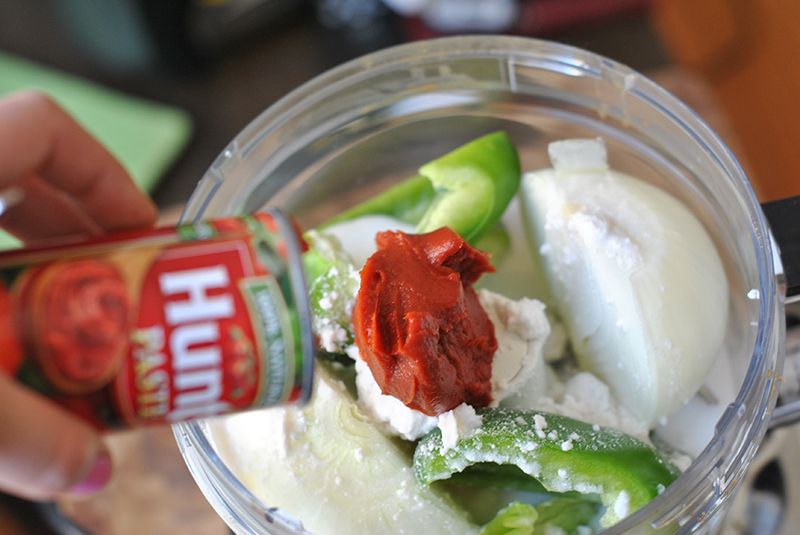 Green peppers and I do not get along well…..
Is the similar to Butter chicken in flavor? It looks very similar. If you are concerned about the white meat drying out then use some boneless skinless chicken thighs. I use both in my slow cooker and have- never had any problems IF I use the low setting and make sure there is plenty of liquid. I read too fast at first and thought you wrote that your tiny kitchen was so small you couldn’t open your eyes and your dishwasher at the same time. Now that would be small! 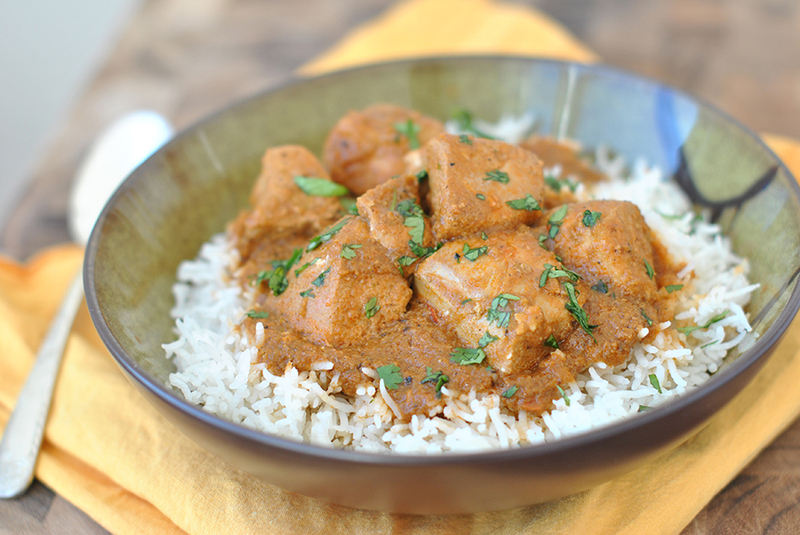 I love curry recipes and the slow cooker – so this looks like a win win! 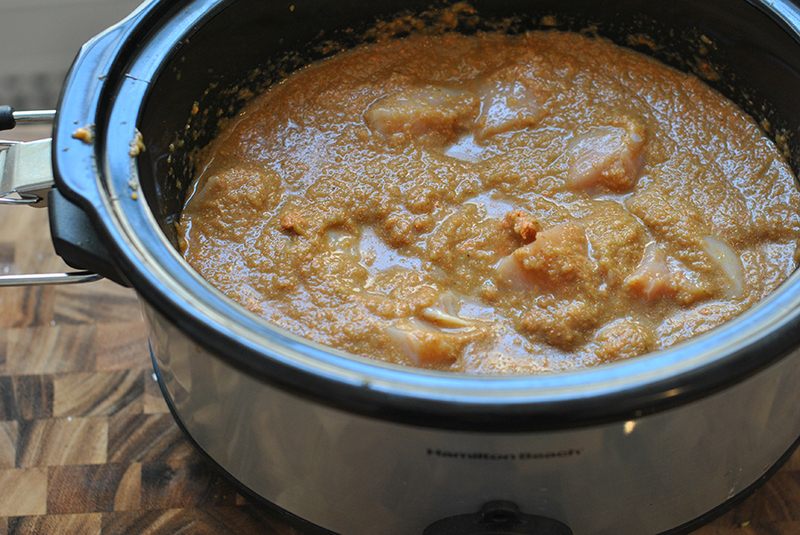 I’ve made so many version of chicken curry (my 3yo likes curry), but never a slow cooker one. Hmm, maybe that’s because I don’t own a slow cooker. I’m definitely gonna try this one with a regular pot and a few modifications to compensate. I think it will turn out just as delicious. I’m definitely trying this recipe! Hope the chicken doesn’t dry out.. This sounds awesome! I will have to try it while my husband is away as he is doing a low carb diet-No rice. I try very hard to accommodate him. Okay, I REALLY have to stop reading this while I’m at work! Totally forgot my lunch today and now I’m craving curried chicken on top of being hungry! Dang nab it! Someone eat something for me!! Look forward to trying it this weekend! Have you tried it with any other protein? 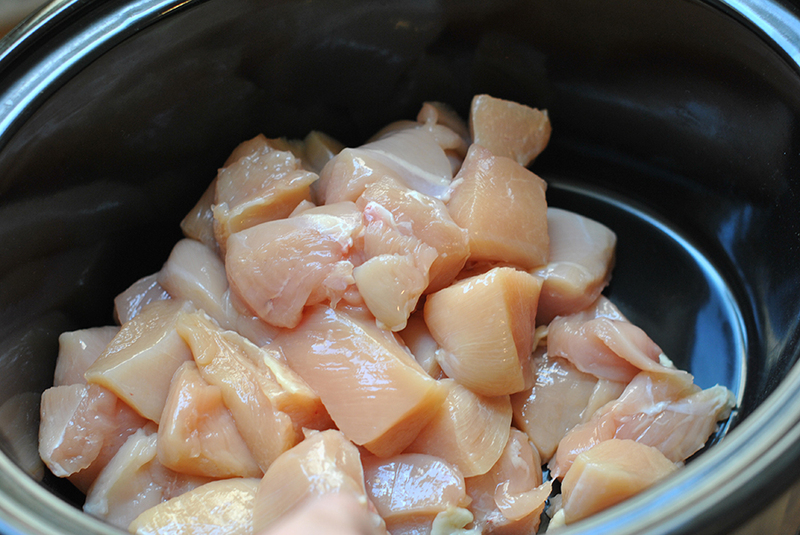 I always get worried about chicken (especially chicken breast) in a slow cooker because it dries out so easily. Travis, the curry is so delicious – but the coconut flavor did not come through as much as I had hoped it would (I love the stuff!) So that’s good news for you I think you will really love this. looks divine! Thank you for sharing the recipe! How strong is the coconut flavor? I sort of detest coconut but I like curry. Dish looks great but I dunno about that coconut lol. 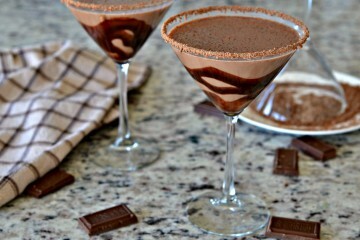 This is a great post and the recipe looks yummy! In the future, would you mind including the recipe in the post so we don’t have to go to another site to find it? 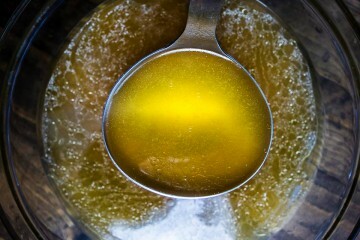 I read this blog in Google Reader and it is great when I can copy a recipe straight from there. Just a thought! Thanks again for this recipe. I’m excited to try something like this in my slow cooker that doesn’t use canned soup. I made chicken once before in the slow cooker, cut into cubes like this, and it turned out totally dried out. Did you find that the chicken was still moist in this recipe?